Raphael called the two men aside privately and said to them: “Thank God! Give him the praise and the glory. Before all the living, acknowledge the many good things he has done for you, by blessing and extolling his name in song. Honor and proclaim God’s deeds, and do not be slack in praising him.A king’s secret it is prudent to keep, but the works of God are to be declared and made known. Praise them with due honor. Do good, and evil will not find its way to you. Prayer and fasting are good, but better than either is almsgiving accompanied by righteousness. A little with righteousness is better than abundance with wickedness. It is better to give alms than to store up gold; for almsgiving saves one from death and expiates every sin. Those who regularly give alms shall enjoy a full life; but those habitually guilty of sin are their own worst enemies. Each year Jesus’ parents went to Jerusalem for the feast of Passover, and when he was twelve years old, they went up according to festival custom. After they had completed its days, as they were returning, the boy Jesus remained behind in Jerusalem, but his parents did not know it. Thinking that he was in the caravan, they journeyed for a day and looked for him among their relatives and acquaintances, but not finding him, they returned to Jerusalem to look for him. After three days they found him in the temple, sitting in the midst of the teachers, listening to them and asking them questions, and all who heard him were astounded at his understanding and his answers. When his parents saw him, they were astonished, and his mother said to him, “Son, why have you done this to us? Your father and I have been looking for you with great anxiety.” And he said to them, “Why were you looking for me? Did you not know that I must be in my Father’s house?” But they did not understand what he said to them. He went down with them and came to Nazareth, and was obedient to them; and his mother kept all these things in her heart. Yesterday, we celebrated the Solemnity of the Most Sacred Heart of Jesus. And in my Homily yesterday, we mentioned that there are different symbols for love. It could be a bunch of roses, a box of chocolates, or a key to a car or a condominium unit. Of course, the more universal symbol of love is the symbol of the heart. But yesterday, we said that for us Christians, there is a symbol that is more specific, because the heart as a universal symbol may be a symbol of love, even for non-Christians, even for non-believers. And for us Christians, a very particular symbol of the greatest love, and, therefore, the greatest sign of greatest love, is the Cross. At nagtanong ako kahapon sa mga tao kung ok lang ba na sa birthday mo o sa Christmas, bigyan ka, as a gift, ng crucifix? At maraming tumawa, kasi it is beyond our wildest dream or our expectation na may magbigay sa atin ng crucifix on our birthday. But after the mass yesterday, one of those who attended the mass approached me. I am not sure, if he's here this morning. He is, I guess, in his late 20's or early 30's. And I was so touched by what he told me. Kahapon, pagkatapos ng misa, sabi niya, "Father, noong 10 years old ako, hirap ang pamilya. The family was financially in crisis. At noong nag-birthday ako no'ng 10 years old ako, walang ibinigay sa akin ang mother ko as a birthday gift. Hindi niya ako mabigyan ng party." Usually nagpa-party eh. Pero that year, dahil walang pera ang pamilya, his mother could not organize a birthday party for him. And all she could give to her son as a gift was a crucifix. But he was so grateful for it, because he felt, he experienced, he's convinced that since then, na binigyan siya ng Mama niya ng crucifix as a birthday gift - dahl 'yon lang ang kayang ibigay sa kanya ng Mama niya - since then, he was blessed in many different ways. And just two or three days ago, he was promoted as a supervisor in his company. Indeed, huwag nating maliitin ang cross, as the greatest symbol of the greatest love of all. Personally, I have a childhood recollection, a childhood memoir. I think it happened only once. Isang araw, nagpaalam ako sa Mama ko to go back to Bacolod, since we stay in Sagay, which is 86 kilometers north of Bacolod. Nagpaalam ako na babalik na ako sa Bacolod for my school, for my studies. Ewan ko kung ano ang nakain ng Mama ko that day. She put her right hand on my head, and with her right thumb, she put the sign of the cross on my forehead, and she blessed me. And I must say, I've been blessed all my life. Truly, the Cross of Christ is the greatest sign of the greatest love of all. And it was when He was hanging on the Cross, that He gave us another great gift - the gift of a Mother. Habang si Hesus ay nakabayubay sa Krus, looking at His beloved Disciple, representing all the disciples from the centuries, He told Mama Mary, who was also at the foot of the Cross, "Woman, behold your son." And he told the beloved Disciple, pointing at Mary, "Behold, your Mother." Talagang napakatindi ng pagmamahal ng Panginoong Hesus sa atin. Hindi Niya lamang ibinigay sa atin ang Kanyang kabanal-banalang puso. Buong puso din Niyang ibinigay sa atin ang Kanyang great treasure - ang Kanyang sariling Ina mismo. He gave us His Mother, to be our Mother, when He was hanging on the Cross. Kaya dapat lang na one day after the Solemnity of the Sacred Heart of Jesus, we celebrate the Feast of the Immaculate Heart of Mary. Dahil nga hindi lamang ibinigay ni Hesus sa atin ang Kanyang puso that was pierced by a lance while hanging on the Cross. At the same time, while hanging on the Cross, Jesus gave to us His Mother, so that like Mary, ikaw at ako - ang puso natin - tulad ng puso ni Maria, ay matutong tumibok kasama ng pagtibok ng puso ni Hesus, at tumibok para kay Hesus. That is why the Catholic Bishops' Conference of the Philippines invites us for this simultaneous National Consecration to the Immaculate Heart of Mary. Why? Because this is part of the celebration of the Year of Faith that Pope Emeritus Benedict XVI declared last year, starting from October 11 last year and ending on November 25 this year. To renew our faith in the love of God. To renew our discipleship in imitation of Mary, the first and the model Disciple, the first and the model Apostle. So March 16, 2021 will be the 500th anniversary of the gift of Christian faith, the gift of Christian life, the gift of eternal life. And since last year, the Bishops' Conference has invited us to prepare ourselves individually, to prepare our families, to prepare our communities, to celebrate the 500th anniversary. And not only to celebrate, but to renew, to deepen, to strengthen, our faith and our commitment to Christ, just like Mama Mary, the first and the model Disciple, the first and the model Apostle. Bakit siya ang first Disciple? It is because she was the first one to hear of the Good News that God will become man, during the Annunciation, and she was the first one who believed. Bakit siya ang first and model Apostle? She was the first to share the Good News to another person during her visit to her cousin Elizabeth. So my brothers and sisters, in today's national consecration, not only do we pray. Of course, everything starts with prayer, because we know that we can do nothing and we know that there is grace, so we need to open our hearts and our minds more and more. We need to open the door of our homes, the door of our communities, more and more. But together with prayer is action. Sabi nga ng mga Benedictines, 'ora et labora'. 'Ora' means prayer; 'labora' means work. Alam natin na 'yong bangka, kung ika'y sasagwan na puro lang kaliwa - ano'ng mangyayari sa bangka? Iikot-ikot ka lang hanggang mahilo ka, hanggang magsuka ka (laughs), hanggang himatayin ka. Eh kung puro kanan ang pagsagwan, ganoon din, iikot-ikot ka lang. Try n'yo po mamaya. (laughs) In order for you to move forward and reach your destination, kailangan magsagwan nang kaliwa't kanan. Ora et labora. So our prayer of consecration demands from us, requires from us - expects - that we also be the very instrument to fulfill what we pray for. If we pray for peace, we should be committed to be instruments of peace. If we pray for riches, we must commit ourselves to work hard and to discipline our budget. If we pray for healing and reconciliation, then we must commit ourselves to reach out and to sit down, and to dialogue. To pray to is commit ourselves to be the instrument to fulfill our prayer. As we pray together with the whole church, the act of consecration to the Immaculate Heart of Mary, alam natin na only God can consecrate, strictly speaking. Only God can make us holy. Only God is the source of holiness. Not Mary, not anybody. Only God can consecrate. That's why Pope John Paul II, when he was still alive, proposed to change the word from consecration to the Immaculate Heart of Mary, to entrustment to the Immaculate Heart. We only entrust ourselves to Mary, as our model, as the first and model disciple, as the first and model apostle, that by her example, and with her prayer and intercession, God will consecrate us, God will make us holy. But because of the force of tradition, we will still continue using the word 'consecration'. Ok na - we continue using the word 'consecration' to the Immaculate Heart of Mary, but we must have the proper understanding that strictly speaking, only God can consecrate us. But we entrust ourselves to the Mother to whom Jesus has entrusted us. "Behold, your Son....Behold, your Mother." And in imitation of her, may you and I be open to God's consecrating act. And since Jesus entrusted us to Mama Mary, as our Mother, then let us always remember that this first and model Disciple, this first and model Apostle, has three important Latin words. The first Latin word is 'fiat'. The second is 'stabat'. And the third is 'magnificat'. 'Fiat mihi secundum verbum tuum'. 'Let it done unto me according to Your word'. These are the words of Blessed Virgin Mary during the Annunciation. Word of faith, trust, surrender, entrustment, obedience. As we consecrate ourselves to God through Mary, in imitation of Mary, as we allow God to consecrate us through the intercession of Mary, let us remember Mary's act of faith, and let us imitate her act of faith. Let it be done unto me, according to Your word, O Lord. The second word of Mary - 'stabat'. 'Stabat mater dolorosa, juxta crucem lacrymosa.' There stood the sorrowful Mother near the foot of the Cross, full of tears. 'Yong kanyang faith, 'yong kanyang 'yes', 'yong kanyang pagsunod, hindi lamang in good times, but also in bad times. Hindi lamang when everything is fine, but also when everything is not fine. It is not only in success, but also in failure. Not only in life, but also in death. Mama Mary's 'yes' was not only in Nazareth, but also in Calvary. Not only in Bethlehem, but also at the foot of the Cross. In imitation of her, 'yon din sana ang ating maging 'yes' sa Panginoon, so that we may be truly consecrated, made holy, made part of God's life, and for life. Just like what Jesus said in the Gospel for today, "Don't you know that I have to be in My Father's house?" Don't you know that I have to be doing My father's business? That is what it means to be consecrated - to live with God and for God, as individuals, and as a community. 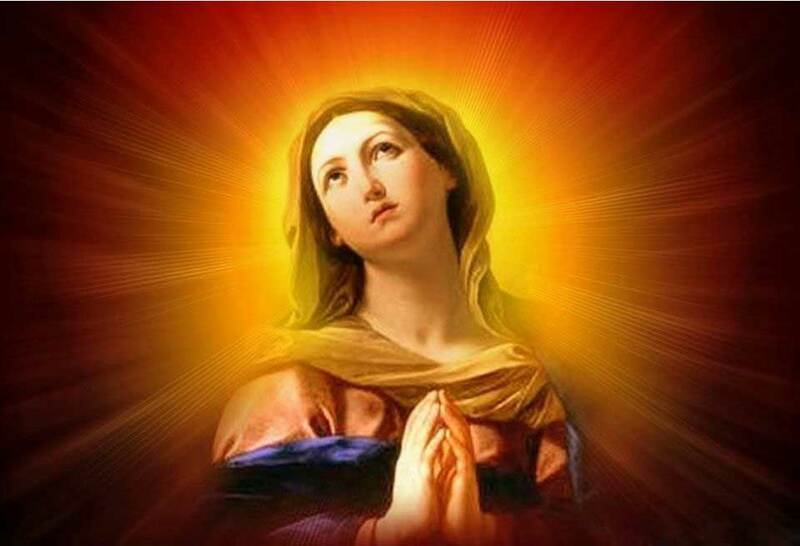 And finally, the third word of Mary is 'magnificat'. 'Magnificat anima mea Dominum'. 'My soul magnifies the Lord.' This is what Mama Mary said at the Visitation. And this song of Mama Mary echoes the First Reading from the book of the prophet Isaiah, as well as the Responsorial Psalm from the first Book of Samuel, sang by Hannah, the mother of Samuel. This song of the Blessed Mother is in fidelity to the faith of the Old Testament, in consonance with the experience of the Old Testament. 'Magnificat anima mea Dominum'. 'My soul magnifies the Lord.' Sa kabila ng lahat, nawa'y ikaw at ako, both in good times and in bad times, both in joy and in sorrow, both in success and defeat, may we truly praise the Lord, because we are with Him. He is part of our lives; He is the center of our lives. And because our 'yes' to Him is an authentic 'yes' like that of Mary. Kaya mga kapatid, ikaw at ako, bilang mga Pilipino, bilang bahagi ng sambayanang Pilipino, ikaw at ako ay mag-entrust ngayong araw, together with the whole church, to the motherly intercession of Mary. Talagang tulad niya, angkinin nating muli, yakapin nating muli ang kanyang fiat, ang kanyang stabat, ang kanyang magnificat, so that like her, you and I may be living temples of the glory of God, consecrated in the truth and the love of the Father, through the Son, in the Spirit.